And not made by me, but by the capable staff at Rosa Mexicano at the Lincoln Centre in New York. 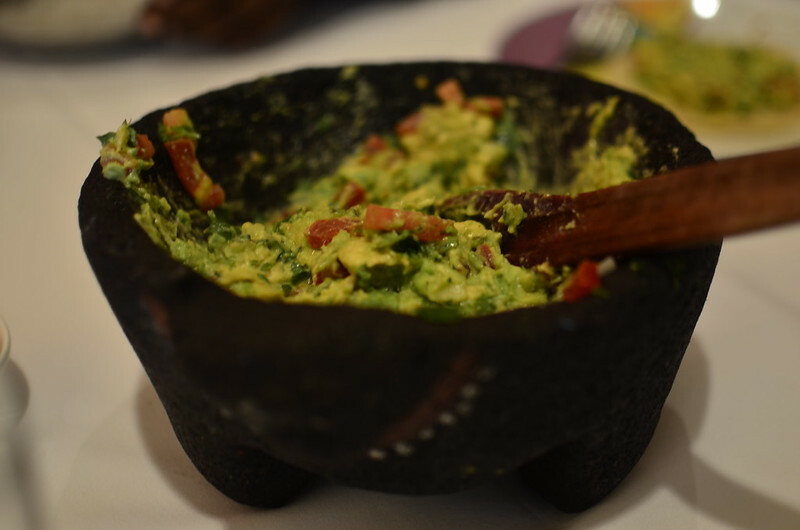 Two years ago, I was wowwed by how beautifully composed the avocado was – prepared as you sat and watched and then had it, served with two types of salsa – a dried red chilli one and a hot, green chilli one with corn tortilla chips and small tortillas for dipping and scooping. This time, P took myself and the children back and R, daughter #2, lover of all things avocado pounced on it. Let’s just say the first ‘mortarful’ was not enough, a second had to be crafted. There would have been demand for a third if I hadn’t insisted that this wasn’t lunch but a mere starter. A waiter comes up to your table when you’re set to order, if you order the guac’ though. He asks what level of heat you would like – mild, medium or hot? We go for medium and he gets to work. He begins (not shown) with the chilies and some onions in the mortar (a tink). I like how confidently he handles the avocados – how he cuts them into grids. The real technique is in how he combines the ingredients. He folds and ‘quenelles‘ them, not pressing down, not mashing but combining the elements ever so gently with a spatula and wooden spoon till a cohesive mixture forms. And yes, he is really going that fast – everything around him is slow but guy’s chopping at amazing speed. On the plate it is a gorgeous array of speckled green, on the tongue – heaven. Cream, perfectly salted, herb and spice. Everything I love about food – balance. All the background commentary is of my daughters trying to convince their brother to try guac’ and bribing him with games. In the end – success. He loved it.